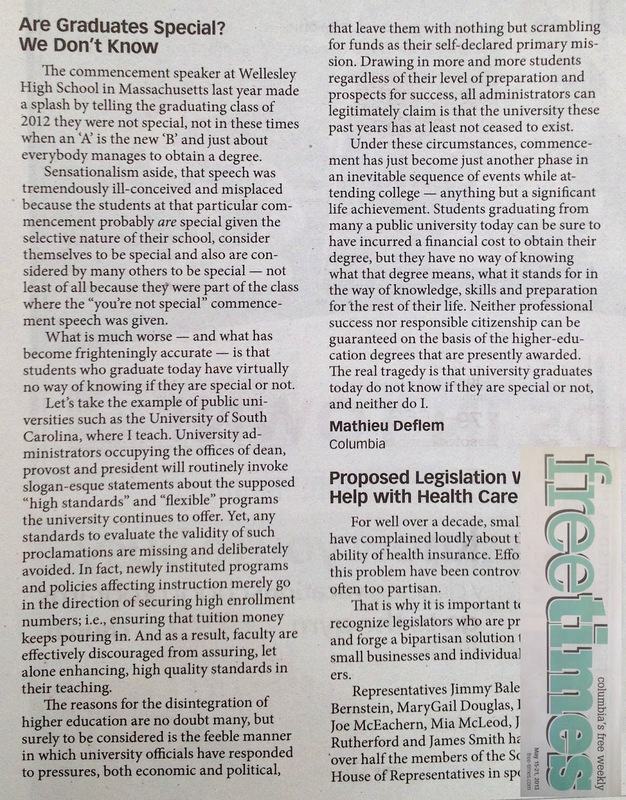 This is a copy of an op-ed published in the Free Times, May 15-21, 2013. Please cite as: Deflem, Mathieu. 2013. "Are Graduates Special? We Don’t Know." Op-ed. 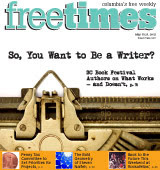 Free Times, May 15-21, 2013, p. 4. The commencement speaker at Wellesley High School in Massachusetts last year made a splash by telling the graduating class of 2012 they were not special, not in these times when an ‘A’ is the new ‘B’ and just about everybody manages to obtain a degree. Sensationalism aside, that speech was tremendously ill-conceived and misplaced because the students at that particular commencement probably are special given the selective nature of their school, consider themselves to be special and also are considered by many others to be special — not least of all because they were part of the class where the “you’re not special” commencement speech was given. What is much worse — and what has become frighteningly accurate — is that students who graduate today have virtually no way of knowing if they are special or not. Let’s take the example of public universities such as the University of South Carolina, where I teach. University administrators occupying the offices of dean, provost and president will routinely invoke slogan-esque statements about the supposed “high standards” and “flexible” programs the university continues to offer. Yet, any standards to evaluate the validity of such proclamations are missing and deliberately avoided. In fact, newly instituted programs and policies affecting instruction merely go in the direction of securing high enrollment numbers; i.e., ensuring that tuition money keeps pouring in. And as a result, faculty are effectively discouraged from assuring, let alone enhancing, high quality standards in their teaching. The reasons for the disintegration of higher education are no doubt many, but surely to be considered is the feeble manner in which university officials have responded to pressures, both economic and political, that leave them with nothing but scrambling for funds as their self-declared primary mission. Drawing in more and more students regardless of their level of preparation and prospects for success, all administrators can legitimately claim is that the university these past years has at least not ceased to exist. Under these circumstances, commencement has just become just another phase in an inevitable sequence of events while attending college — anything but a significant life achievement. Students graduating from many a public university today can be sure to have incurred a financial cost to obtain their degree, but they have no way of knowing what that degree means, what it stands for in the way of knowledge, skills and preparation for the rest of their life. Neither professional success nor responsible citizenship can be guaranteed on the basis of the higher-education degrees that are presently awarded. The real tragedy is that university graduates today do not know if they are special or not, and neither do I.